Here was a future project. It's a 1953 Panther. It was a rider and never did get a repaint. Picked this one up from my buddy, Keith Kodish. Keith is a prewar bike fiend and has some awesome bikes! So I'm glad he passed this post war bike along to me! 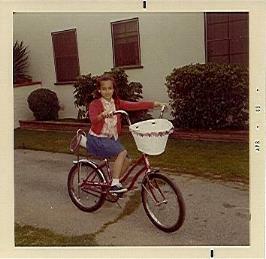 Next on the "find it" list for this bike was a Delta Rocket Ray. Look at this beauty! This is a 1950 Excelsior that I got from Bob Pavao. Also known as a Hornet! Polishing it up really brought out the original blue. I found a tank and even a Rocket Ray! Finally got those painted. The seat has been redone. My friend Bob does excellent paint work. If you haven't visited his web site yet to see his work, you should! A 1966 5 speed Fastback. Here is a little more detail on this one. It was in good shape when I got it but I blew it apart anyway, cleaned, polished, lubed and reassembled it. Looks pretty good, huh! All original except for the saddle. Thanks for the bike, Sam!! Here was one for my little buddy! Another one to clean up for him to ride when he gets big enough. Most of you Stingray guys already know this is a Lil' Tiger. Gotta start them out right! This one I built at the same time I was building the Phantom. For my daughter, Amanda. She went to a swap and sold her Spitfire middleweight and told me to build her this! Cool, huh? 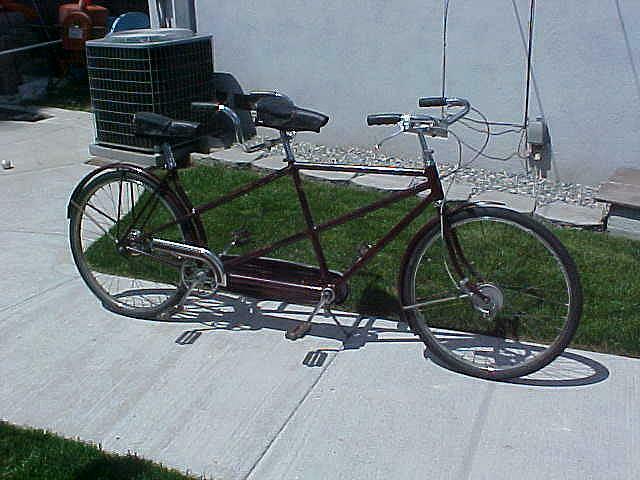 It is an early post war Tandem with the S4 rims. 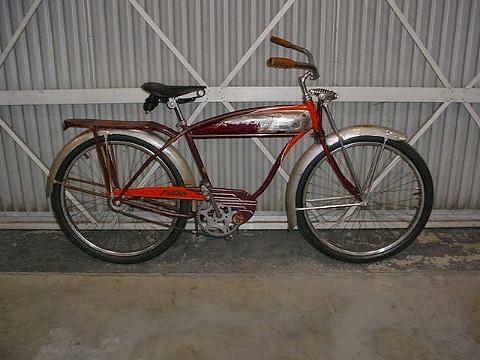 This is a 1941 Autocycle. EA horn button. Locking springer. Super wide handlebars. Now I have the proper chain guard and rear fender thanks to Bob Pavao. I think I want to find another rack. This is one of the ones that started my sickness! It is a 1978 Spitfire. It is all original and looked almost brand new when I found it! It was hard to let it go but it has now found a new home. 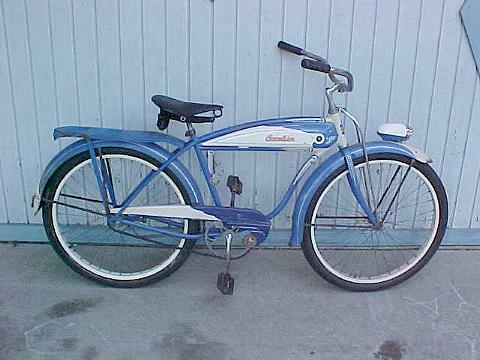 The owner had one when he was young and it was stolen from him. I'm glad I could help him regain some of his youth! Click on the photo to see it in more detail! This is a 1955 Cycle Truck. Compare it to the 1952 Cycle Truck that I have on my projects page. Notice the difference in the down tube and extra brace near the sign. S-2's front and rear. Originally it was black. Click here to see how it looks now! This is one came in and left almost as quickly. A 1950 Wasp with an amateur restoration. A 1956 Flying Star. 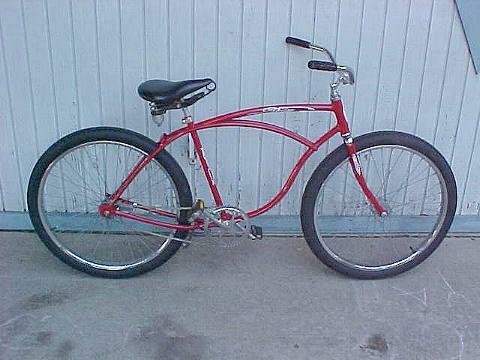 24" wheels, two speed manual Bendix hub. Probably one of the last years for the DX frame. 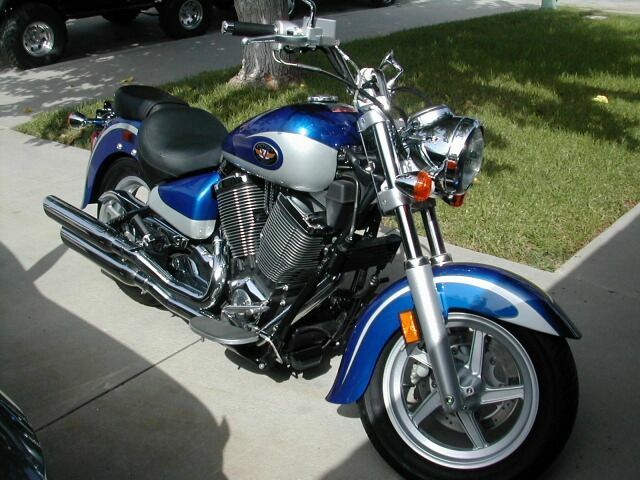 Here is the bike that showed up with the maroon B6. A nice girls World. 1948 also. Someone talked me out of the fenders and so all the rest of the parts slowly disappeared. 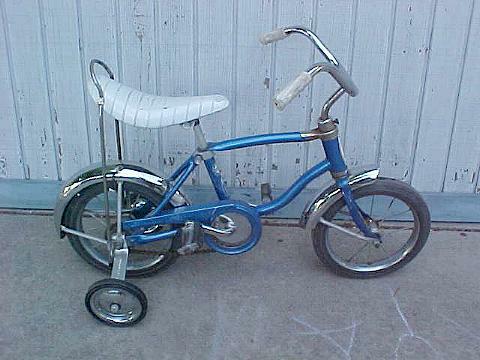 This one was my limo! I'm guessing it is an early 70's. Just a regular Twinn. Two speed Bendix Automatic. Faded paint and decals. S-7 rims front and rear with heavy gauge spokes. 1946 Green on green B6. 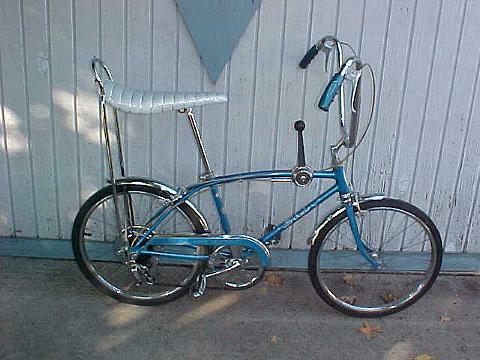 While searching for my Schwinn Cycletrucks, this one passed through. Here is another oldie but goodie!! Here is one I just never got to! Finally completed! This is a Bill Jones special. 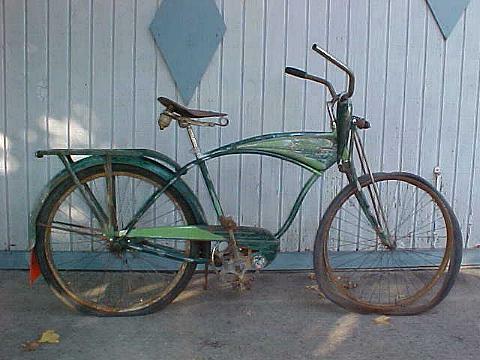 A prewar "Zep" frame. Somewhat modernized! It has a 1/2" pitch chain on an Autocycle type of skiptooth chainring. Yellow powder coat. Basic wheels, pedals, and grips. Bill Jones is a good friend of mine who told me "I don't want a kickstand! I want a bike I can just jump off and throw to the ground!" Well, here it is! This one belongs to my buddy Tom. Kind of a custom cruiser threewheeler. Maybe a stretch limo. 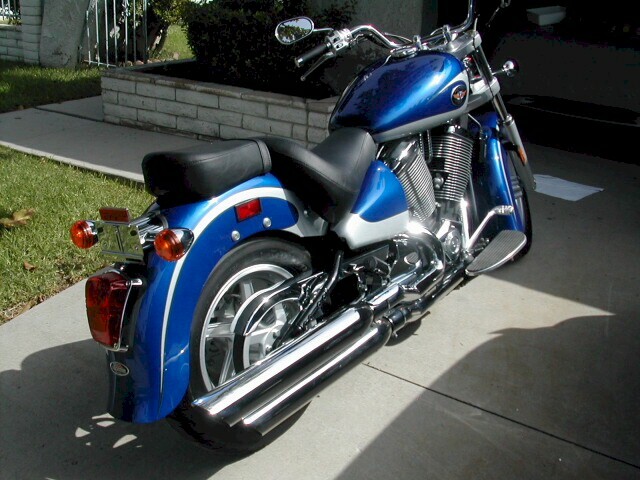 26" S-2 front wheel, 20" S-7 rears. The finish is satin black. Frame is a 1980. It started life as a Cruiser 5. I made a custom hardwood bed for it. A great ride at the swaps. This is a custom job I did for someone. A matching pair of DX frames. Deep fenders and killer paint. Stainless spokes and bright chrome everywhere. The black one will receive flames. A his and hers set of bikes. The pictures don't do them justice! Somedays I just can't stop collecting them. This was a 1936 Motorbike or Cycleplane. Needed a lot before it could resemble it's former deluxe glory. What the heck, I'm a glutton for punishment!! This also was the future "How to remove stuck necks!" bike and that sucker was really stuck!! This bike was given to me for free so I kept it at my place of work. We have an absolutely huge yard, so this bike helped me to get around! This was another freebie I created to hang around the shop. This is a Worksman Bike. 70's? 80's? It almost got killed by a fork lift, a crunched front wheel. So we stripped the original black paint, changed the color, polished up some stuff, and bought a new wheel. Good for another 20 years. Another yard bike, this is the one that the Boss uses! Here is my little brother on my older brothers Pea Picker. I think the bike ended up getting stolen! Thanks to all who have identified it as a 1970 model! 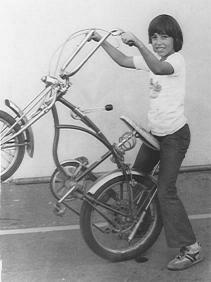 This is me in my pajamas getting a new bike for my birthday. Looks like this one is a Murray Eliminator. I would like to thank Mark Wilson for being the first to I.D. it and send me a photo! Here is sis' on her Fair Lady in 1968. 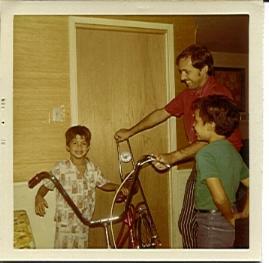 Just a Schwinn buying family! This is how we move them around in bunches!! It was my parts chaser! !